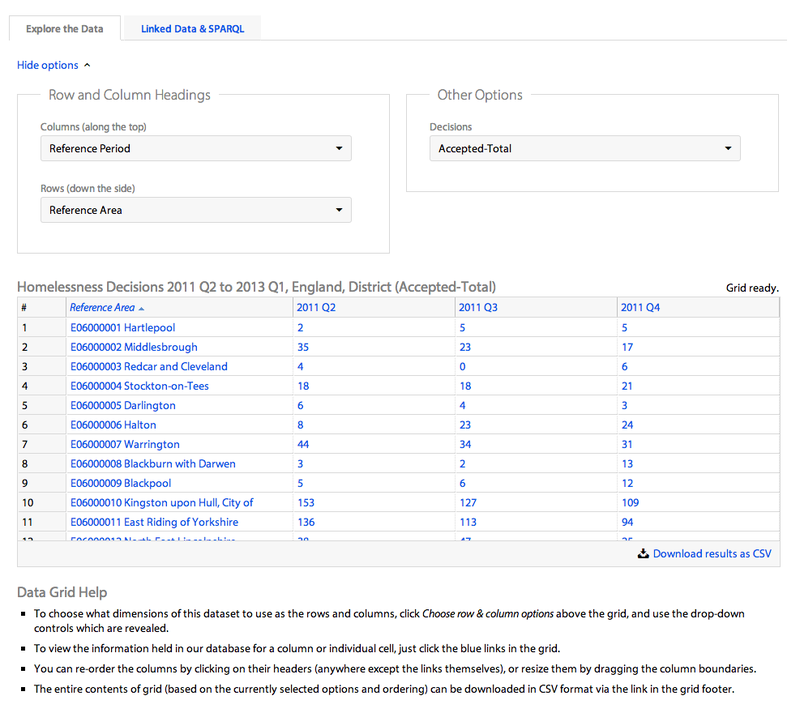 This week, the Department for Communities and Local Government has launched new data content, and important new features in its OpenDataCommunities service. Helping us to quickly grow and extend the Department’s fully open, and accessible data outputs. Making it easier for you to discover, explore and understand our open data. We have been working closely with several key users to understand and prioritise which datasets to release via OpenDataCommunities. This has produced a list of over 100 statistical outputs on Local Government Finance, Fire and Rescue, Housing, and Planning. We have also updated various Geographic datasets, bringing them in to line with latest outputs from Ordnance Survey. These include data on almost 1.7 million postcodes, and extensive information about individual Local Authorities and associated geographies, such as wards, and neighbourhoods (as defined by Lower Super Output Areas). This is just the beginning. 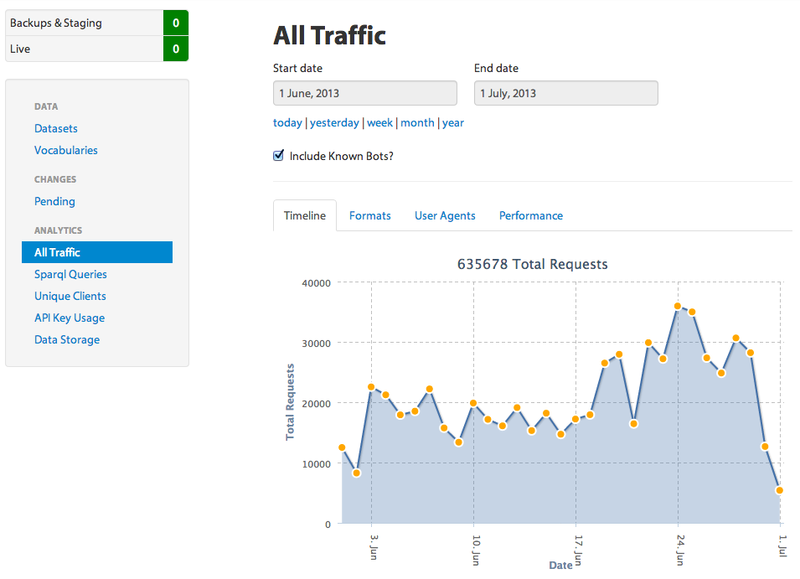 We are now pushing to progressively release and maintain more data, focusing first on outputs requested by users. To enable that, OpenDataCommunities now includes significant new tools for DCLG to manage data publishing directly from its internal systems. We have the technology and a robust mechanism to automatically generate 5-star statistical data internally, and quickly make it available within OpenDataCommunities. I am therefore confident that we can quickly bring new statistical data on stream, and also keep it in sync with future updates: e.g. so that content in OpenDataCommunities is released alongside future editions of our statistical releases. We want to see you using our data in a wide range of new, innovative ways. We think this begins with offering better and smarter ways for you to find, and understand what we hold, and then quickly access the underlying sources. As a key first step, we have published new themes that reflect the Department’s full range of statistical outputs. This includes background information on the range, type and number of datasets currently available via OpenDataCommunities. You can access our theme list here. We are also working to align OpenDataCommunities’ themes and content with the equivalent information published via other channels: in particular, data.gov.uk and DCLG’s main website. More news to follow as we firm up our plans over the coming weeks. e-mailing us directly at ODC@communities.gsi.gov.uk. 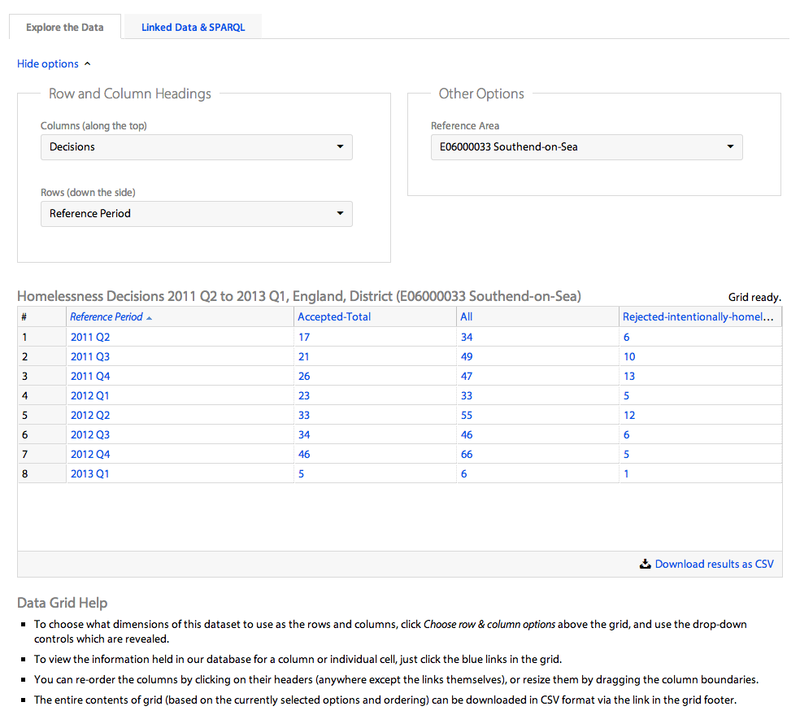 OpenDataCommunities now includes an innovative new Data Table explorer. Download the resulting table in a CSV file, for re-use in your preferred software tools. 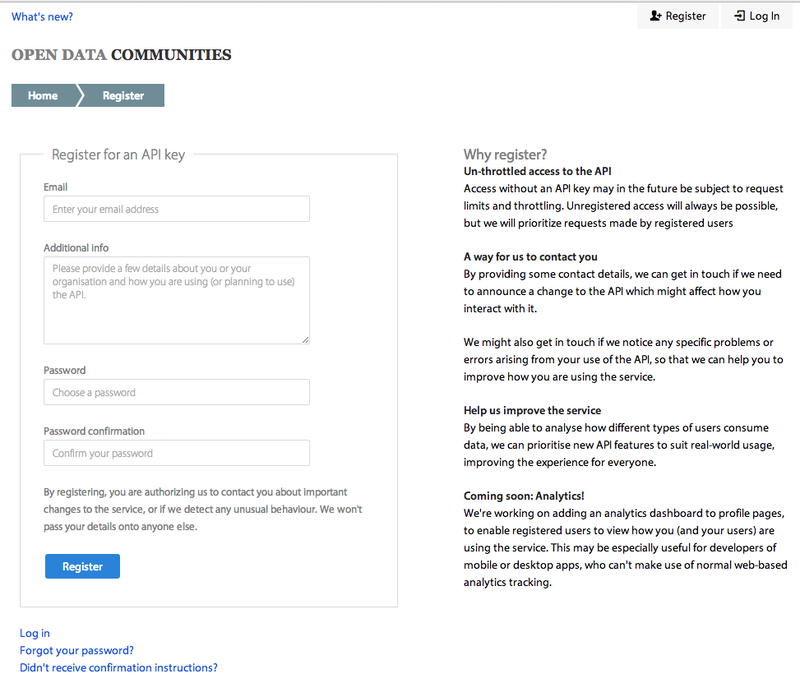 I hope that this new tool is a significant step forward in lowering the barrier to accessing and re-using our 5-star datasets. For the more technical user audience, we are now offering API keys (see screenshot below). We believe this is an important mechanism for strengthening engagement with software developers and innovators, and look forward to seeing lots of new requests for an API key. We are keen to hear your views and feedback and encourage you to join our on-line discussion forum or get in touch at ODC@communities.gsi.gov.uk.